New white paper from Distributed Wind Energy Association (DWEA) lays road map for growth of “behind the meter” distributed wind in America. 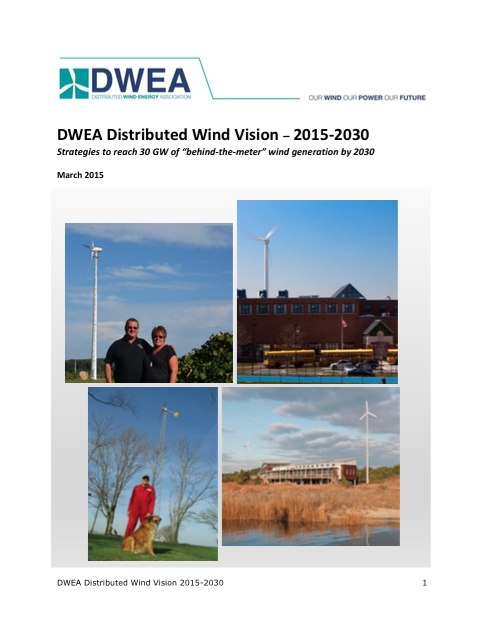 WASHINGTON DC – On the eve of their annual Business Conference and Lobby day, the Distributed Wind Energy Association (DWEA) released the Distributed Wind Vision, which highlights the vast potential of the distributed wind sector. This new white paper outlines the strategies to reach 30 GW of “behind-the-meter” wind generation by 2030. The document showcases what a true American small business success story this industry is, with over 90% of the small and medium systems installed in America in 2014 manufactured here. These American-made turbines have to potential to provide electricity to homes, farms, businesses, and public facilities across all 50 states. Encourage states and utilities to provide incentives for distributed wind on par with the solar incentives they have successfully employed to grow their solar markets. Smart policies that grow the market and advance the technology of distributed wind also provide important benefits in addition to the 150,000 jobs created, including: economic development serving primarily rural areas, additional clean energy choices for Americans, strengthening the grid, promoting resilience and more. Members of the media are invited to attend the Business Conference and Distributed Wind 101 sessions and can RSVP to lglickman[at]distributedwind.org for more information. The Distributed Wind Energy Association is a collaborative group comprised of manufacturers, distributors, project developers, dealers, installers, and advocates, whose primary mission is to promote and foster all aspects of the American distributed wind energy industry. Distributed wind is the use of wind turbines at homes, farm and ranches, businesses, public and industrial facilities, off-grid and other sites connected either physically or virtually on the customer side of the meter to offset all or a portion of local energy consumption or to support grid operations. DWEA seeks to represent members and associates from all sectors with relevant interests pertaining to the distributed wind industry. For more information on DWEA, please go to www.distributedwind.org. Follow us on Twitter @DWEA and like us on Facebook.